Well today was my final one 2 one session before the therapist leaves in 2 weeks time. Aside from learning that he’s moving employment to a subsidiary of CAMHS and may be able to continue working with us in his new employment dependant on his new employer, I didn’t learn anything. There was talk of attachment difficulties with all 3 girls being apparent (well there’s a surprise, not), there was talk of ‘other possible’ issues with big girl (durrrrr), there was talk about knowing middle girl no more today than the first day he saw her and there was talk of how sessions solely for me, alongside sessions for the girls may help. I’m expecting a call before he leaves in 2 weeks letting me know of the plan. After 10 session, 6 months, lots of tears, missed school hours and plenty of money spent on parking, we’re no further, wiser or even the slightest bit ‘therapized’ (if that’s even a word which is suspect it’s not, but I like how it sounds) than we were 10 sessions ago. CAMHS decided in view of the self harming incident with big girl at school recently they should see her. We arrived at CAMHS this morning a little early meaning big girl had time to calm down, relax and focus on some colouring for ten minutes. We were called through by the therapist and big girl’s anxiety levels instantly rose. The therapist quickly explain the reason for the appointment and told her Mummy would be waiting outside while they had a 15-20 minute chat. I’ve never left the room before, how did he think she was going to react, how was this supposed to help?! I have no idea what was said, but big girl rushed to the door to check I was still there several times during their brief chat. I was called back in. The therapist told me that she hadn’t told him anything revealing and that we could chat about it further at our 1to1 tomorrow. Big girls anxiety levels quickly dropped and all was calm, or so I thought. I took her to school and asked them to keep an extra close eye on her. I saw her teacher later on that day, and she informed me that big girl was clearly anxious upon rejoining the class and when a child asked her where she’d been, she burst in to tears. The conversation with the teacher pretty much went like this. Teacher : You should keep her home when she’s had an appointment, I don’t know how to or even want to deal with her. Realistically I can’t give her a day off school everytime she has an appointment, she’d loose too much time thus making school even more difficult for her. Besides, being home alone with me would make her just as anxious. So for now, it seems better to stick to routine and normality and hope she muddles through. So far all CAMHS seem to do is upset my girls with no therapeutic input to even make the upset worth while. Tomorrow I have a 1to1 with the therapist, I wonder how that will go. Its hardly surprising that middle girl feels resentment towards baby girl. For most of her memorable childhood she was in foster care with her big sister. Her big sister looked after her and allowed her to take the spot light as she was favoured by their foster carer. She was the baby of the foster family and allowances were made and extra treats given. She controlled and manipulated the adults around her, her weapon was ‘silence’. Then along came her baby sister who’d been in a separate foster care placement. Suddenly she was no longer the baby of the family and big girl had found a new ‘baby’ in the house that she could follow around. Big girl stepped forward and middle girl stepped back. After only a few weeks of living together all 3 girls were placed with us. Baby girl felt all confused and out of sorts and used ‘food’ to control the adults around her. Middle girl attempted to control the adults around her with ‘silence’ but unlike her days in foster care her attempts were futile. Big girl tried to take care of everyone and instructed her sisters to ‘call me mummy’ and paid all her attention to baby girl, perhaps cause she was the youngest, or perhaps because she was the easiest to manipulate. As time went by they all struggled to find their places, baby girl desperately wanted to feel part of the group and pushed for attention from both of her sisters, big girl was only too willing to give it, with middle girl gradually stepping further back and allowing her needy sisters to take the ‘attention seeking’ stage. I sit here today listening to baby girl and big girl doing some drawing together whilst middle girl loudly stomps up and down the playroom shouting and singing and playing loud music and doing anything she can to irritate her sisters and take some of their attention for herself. She’s understandably tired of being left out, she’s angry at her baby sister for taking her big sisters attention away from her, she’s fed up of sitting in the background and she’s going to do everything she can to put things ‘right’. It seems targeting baby girl in a bid to get her into trouble and then misbehaving herself to bring down the spot light on to the smile that she hides behind are her battle tactics! She’s declaring war on her sisters, things are gonna get ugly! I’m talking of course about my middle girl. Over the last 2 years she’s suppressed her feelings and emotions and stayed hidden behind her huge fake smile. On occasion she’s allowed me to see the odd glimpse of what I can only describe as ‘disgust’. Lately I’m seeing more and more of this, there’s also the defiance as she stares me dead in the eye whilst telling me yet another ludicrous lie and the anger and look of pure rage as she’s dealt the consequences of her actions. She’s like a volcano that’s been rumbling and is now bubbling, there’s anger and rage seeping through her pores, and I don’t know how much longer she’ll be able to hold it all in, I think an eruption is imminent! Time to run, hide and take cover? So big girls been referred by the Community Paediatrician for an assessment to see if she has an Autistic Spectrum Disorder (ASD). Today was our first appointment. I found I did very little talking which suited me and made a refreshing change. The psychologist observed my big girl quite a lot whilst chatting to me in general about ASD and what it means. She interacted with big girl a few times with some of the toys in the room and commented about how there was little to no eye contact made and that she wasn’t really ‘playing’ with anything. She asked me about her ‘play styles/behaviour’ and if today she was behaving typically, to which I replied, that aside from being understandably anxious, yes she was. She asked about our family and also a little history on the adoption and how we found the process. We chatted about post Adoption support, or the lack of it and we covered school and some of the issues my daughter faces there. We chatted about her sleep patterns and some of the issues and challenges we face with all 3 the sisters as a group and their dynamics. All in all the appointment lasted an hour, it went well I felt and I was reassured when the psychologist told me she can ‘see’ why the referral had been made and that it was correct for her to have been referred to them, although, understandably at this stage she couldn’t comment as to whether what she was seeing due to ASD or something else. I suspect the something else she has in mind is ‘attachment’ but we’ll see. Big girl coped well to, she was understandably anxious and cautious about what was going on, she was hyper vigilant and whilst seeming to be playing in the background, she listened to and saw everything. She did her usual thing of drawing me an ‘I love you Mummy’ picture. She always does this during appointments, its as though she needs to reassure the other person in the room that she’s ‘happy’ and doesn’t need to be ‘removed’ 😦 she was very anxious during the appointment which resulted in what I describe as ‘silly’ behaviour but she coped. She was clearly eager to leave being the first one out the door and down the steps when the psychologist told us it was time to leave. She was still ‘very high’ when we left the building and wasn’t too impressed at the idea of returning to school so we had a quick browse round a nearby supermarket and chatted about the appointment in order to calm her down. I wondered out loud about how she must have found it all very strange and worrying going to another ‘appointment’, I explained that the people in this place were hopefully going to help her, by making school a little less difficult for her so she wouldn’t find it so hard and could enjoy it more. I promised her it was nothing to worry about and we talked about promises and what they mean and how they must never be broken. She was regulated and calm again. Back to school she went. I on the other hand was left feeling, well, kinda sad really. I went in to adoption knowing there would be behavioural and emotional challenges that we’d face over the years. I expected defiance, I expected destruction, I expected temper tantrums, I expected shouting, screaming and lots of crying, but from them, not me! So I never once thought it would be easy, but I didn’t know just how hard it would be or how long everything would take and how much I’d have to fight for my girls. I wasn’t prepared for the amount of help we’d need, or how unwilling everyone would be to give it, I couldn’t have envisaged the resentment issues between baby girl and middle girl, I knew nothing of the sleep issues we’d face, or the controlling behaviour baby girl would throw our way or the manipulation big girl would use to protect herself, I wasn’t prepared for cognitive issues, I certainly didn’t know what ‘compliance’ was or how difficult compliance would be, I didn’t know just how much I’d struggle to spread myself evenly between 3 unattached, attention demanding children, I didn’t foresee the difficulties of 3 and how one would always feel left out, I didn’t know that some of my friends would leave because they couldn’t understand or how some people would judge me because they to don’t understand, I didn’t know that in 2years time I’d feel even more helpless and out of my depth than I did back then. I didn’t even have any understanding of how all of this would make me feel, I probably still don’t. In the last 12 months I’ve met with Psychotherapists, psychologists, school Senco, Senses teacher, occupation therapists, speech and language therapists, Gp, school nurse, community paediatricians, physiotherapist, class teachers and social workers all with a view to help my big girl to be happy and she’s not even 8 yet. None of this was what I expected, none of this is what I’d have chosen. I know no one has the luxury of deciding the future for their children, and everyone’s basic hope is that their children grow to be well adjusted happy and healthy individuals and then there are also those bigger hopes of a good education, prestigious job, a family of their own and a network of friends to support them through life. I wasn’t naive, I knew the girls poor start was likely to have an impact on them well into adulthood with their being a strong chance that those hormones and emotions would take president over education for most of their teens, I just never expected my days would be full with all these appointments and assessments and consultations and telephone calls, it doesn’t leave much room for happiness, which is the one thing I took for granted. I’ve gone off on a bit of a tangent here, but this mornings appointment has just left me feeling kinda sad and empty and needing to ‘off load’, so consider yourselves now ‘loaded’ with the contents of my head, ahhh that feels better. Its all for a good cause too, I really need to get some house work done. When I started writing this I had a head full of jelly and I couldn’t even think where to start let alone how to actually clean, but now I’m off to get the vacuum out. But before I go, I’ll just let you know that Big girl also has an appointment with CAMHS Monday, they’ve called an emergency appointment because of the ‘self harming’ issue at school last week so there will be more about that then. I wonder about Attachment Disorders……………………………Again. I read a blog today about ‘Attachment Disorders’, I’d posted some information on attachment a while back and it got me thinking again today, as usual, I really must locate that off switch for my brain, but before I do I want to share my findings (more like wonderings). I completed a Childs Attachment Disorder Checklist for each of my girls, below is what I found. True for all 3 girls. Baby Girl – Not true, although we have had eating issues. Baby Girl – Not true, although she does gravitate towards the ‘difficult’ children. Possibly true for all 3, they do demand attention and will compete for it. So what does all this mean I wonder, or am I just wondering too much. I don’t need a checklist to tell me I have traumatized children, but I do find these results rather interesting. So how do you parent an attachment disordered child. I really don’t know. We don’t have a diagnosis for any of our girls as yet which is probably why I still trawl the internet for answers, understanding and resources. I stumbled across a page offering tips and advice on how best to handle/cope with parenting your unattached child. I particularly like the part that says ‘AD children have a sixth sense for finding every button a parent has and pushing them all.‘ Dont I know it! It also talks about how and unattached childs main objective is to ensure safety, not love, unlike the typically attached child who seeks out love and affection as a priority, hence the saying heard frequently in the world of adoption ‘ Sometimes love isn’t enough’. I particularly like the ‘Specific Techniques’ part, I can relate to so much of it, and its good to know that I mostly opt for the effective techniques recommended. I kinda feel that this post is a bit inconclusive but I guess that’s because we are still at the ‘wondering’ stage. I’m also wondering how long it will take for us to get to the ‘knowing’ stage. So how does you secure/insecure child score? Please share. Ear ache is what I have from being on the telephone all day! After yesterdays incident with big girl at school it left me in quite a panic. I started off this morning by calling the school Senco, she told me she’d been filled in by quite a distressed teacher about the events of the day and she herself sounded quite worried about the situation. She openly admitted she didn’t have much experience or knowledge about self harming and was not sure how best to support big girl. She talked through the various different options she would usually opt for, but felt that because she was already ‘under’ CAMHS, they should be the first port of call. She expected they’d arrange an emergency appointment to see big girl, I was less optimistic. She also hoped CAMHS would help school with how best to support big girl with her emotions, again, I was less hopeful. I agreed to call CAMHS and report back to her. CAMHS lines were busy, I left a message for them to call me. Feeling impatient I decided to call the placing authorities post adoption support team, on the off chance that they’d care. They didn’t. I called CAMHS back again and was passed to the duty worker, in the absence of our therapist who only works Mondays and Tuesdays, how useful. The duty worker was very softly spoken and in a very kind tone she pretty much said ‘I don’t know, I can’t be bothered to find out more, its not my job, I’ll get your therapist to call you Monday’. Great, thanks a lot! I called the parent support worker and left a message for her to call me. I received a call from the Salt (speech and language therapist) who told me she’d been in school today to observe my big girl’s social difficulties. She was pleased to inform me that she’d seen her on the playground chatting to some peers and sharing their magazine with them and felt there was no real cause for concern and planned to discharge her, of course 10 minutes is plenty of time to asses her isn’t it! What she hadn’t been aware of during her short observation, and what I later discovered, was that the ‘peers’ she was chatting to, were part of the buddy scheme reinstated today, and If she had taken the time to talk to the school staff during her visit she would also have known about yesterday. She didn’t. She hasn’t discharged her. So back to the school Senco I go, I fill her in on the useless ‘professionals’ assigned to support us and we talked about options. She’s going to make a referral to the Educational Psychologist for September but warned me that she’s not likely to receive much support as a result of this, the school themselves had only had 12hours of the Ed Psyc’s time since September and even that was divided between several children. We also discussed getting a statement for her emotional and social needs and she said the Ed Psyc would possibly be able to support this decision. Finally we talked about how it might be an idea to reduce the time big girl spends on the playground and perhaps, in the absence of lunch clubs for her to attend, they could find her some ‘jobs’ to do at lunch time (as this is when big girl struggles most) i.e help in nursery, tidy the library, help clean up the dinner hall. All sounds like child labour I know but I can assure you worried readers that she’ll love anything like that, it could even boost her self esteem by helping her to feel useful/valued in school. So where does that leave us now? We’re awaiting a call from the therapist next week. The PSW has a message to call me. And the school will continue their struggle to support her with the limited resources and experience they have. The school Senco is in a bit of a panic and feeling as worried as me I think. 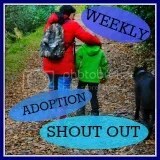 And post adoption support (ha!) they still have their heads in the clouds thinking everything is ok.
Big girl, well she is still trying to hold herself together, her walls higher than ever, still unable to trust the people around her. And me, I have a headache, again.